The Goodwin Library is a publicly funded, privately endowed institution serving the town of Farmington, New Hampshire and several surrounding communities. The Goodwin Library is a public library that serves as an information center for the personal, cultural, and social growth for the community of Farmington. The Library maintains collections and implements programs that address the community’s changing informational and recreational needs for education and literacy. The collections, materials, and programs are offered in a variety of formats to ensure equitable access for all. The Library believes that free and open access to information and resources will establish the framework for an informed and involved community. The Public Library Association was formally organized on December 8, 1890. In 1927 the land on which the present library stands was purchased from E.T. Wilson. George Goodwin of West Milton was persuaded to build a library and thus provide not only a source of learning for the youth of the community but to create an enduring memory to his name. The corner stone was laid on August 23, 1928, the Goodwin Library was dedicated on May 10, 1929 and was opened for business the next day. Today the library contains approximately 18,000 volumes and has a circulation of 40,000, including Inter-Library loans, downloadable books and online databases. Back Row: Amy Cornwell, Pam Groat, Tami Larock, Linda Seaward and Patience Taylor. Greetings from your GOODwin Library! The Goodwin Library had another great year with focus on our patrons, programs and services at the center. We are blessed to retain a core of dedicated staff members: Amy Cornwell as Assistant Director, Joyce White as Children’s Supervisor, Kayla Morin as Children’s Services-Programming and Inter-Library Loan Librarian. Other staff members: Morgan Barrett, Pam Groat, Patience Taylor and Susan Blum are involved with many library functions such as: circulation duties-patron maintenance, Inter-library loan support, collection maintenance, cataloging, researching items to add to our collection and weeding of underused or damaged items, as well as monthly emergency equipment inspections, etc. Our Page, Moriah Saddler fills in the gaps of routine collection maintenance by shelf reading, locating items for Holds/ILL’s, weeding, shelving items and generally helping out where needed! Last, but certainly NOT least, Linda Seaward-a former staff member-returned to be our Custodian in mid-2016. Linda has year’s long experience in this field and goes above and beyond to keep our building looking great. Many of the changes in the last few years were taken with the deliberate intention of improving our services while tightening our belts without sacrificing quality of our many programs, outreach and initiatives. As a reminder we now have a Notary Public on staff who will notarize your documents for free or willful donation. Appointments are encouraged, but not necessary. No Notary services available in the last half hour of the day. Also, staff members have been certified in CPR and the use of an AED device. All staff members have completed “Crowd Manager Training”, which certifies us to have more than 50 congregants at a program. Cards Created (includes renewals) – 1,034!!! 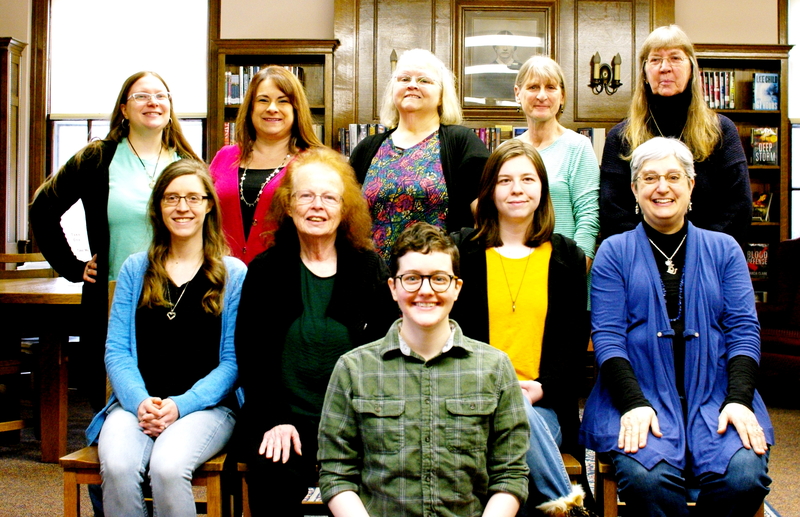 In addition to maintaining patron services, the library staff worked diligently to enhance our programming and outreach to our patrons and the community. All of our programs are free and open to the public. One-on-One Computer and Device Classes: Due to the diversity of technology needs in the community, the library continues to provide one-on-one computer or device training to patrons. The subject of these classes ranges from basic computer use to selling online and more. Appointments are required. We hosted FREE Federal income tax preparation and Low Income Homeowners Tax Relief filings through the Volunteer Income Tax Assistance (VITA) program, who provide these services. Community Cinema: Each month the library invites the community to view (mostly) newly released movies. We provide the popcorn; you provide the camaraderie and laughter! Homesteaders: This monthly program focuses on teaching skills that range from gardening to ice cream making, or a make and take craft. Many local donations of materials, as well as time, keep our costs low. Polar Express Event: A much anticipated and beloved community event. We celebrate the magic of Christmastime through stories, caroling, hot cocoa and yummy baked goods, as well as a craft to take home. Story-time Sessions: Reading aloud to children enhances their vocabulary and improves their ability to read. The group setting can also help children develop social skills. Our librarians engage the children with age appropriate read-aloud stories, songs, crafts and activities. Story-time groups are hosted once a week for six weeks and are currently offered in the winter, spring and fall. Pre-registration is required. 1000 Books before Kindergarten: A nationwide early literacy initiative to encourage parents and caregivers to read aloud to children. We offer incentives for levels of completion up to and including achieving 1000 books read! Summer Reading Program: The library hosts a free Summer Reading Program (SRP) for youth and families to encourage reading year-round. It is our biggest event of the year! We received two grants: The Kids, Books and Arts (KBA) grant that helped us to bring Cactus Head Puppets to perform at our SRP kickoff and the Children’s Literacy Foundation (CLiF) Summer Reader’s Grant, which allowed us to host a storyteller and award 2 brand new books to each child who attended. We are extremely grateful to area businesses who donated prizes that were awarded to participants who met their reading goals. Overall, our SRP participants read over 2086 books in six weeks! “Little Free Libraries”: Free books for the taking, in a several town locations! Thanks to all the participants who host these bins! Family Place workshop geared for parents and children five and under, brings families and alternating professionals together in a no-stress environment. Children and parents can play interactively, while being able to ask any questions they may have of the professional, such as a speech therapist, nutritionist, etc. We are always seeking ways to promote our library and its usage. This year we set up a sign-up station on Election Day and signed up/renewed over 100 accounts! Families with children going into kindergarten were presented with an opportunity to attend our “Kindergarten Meet and Greet” so their children could meet each other and the families, too. We attend functions such as the HWMS Fair, and host 3rd grade visits (where the children get to tour the Museum as well) to encourage children to use our library. The Friends of the Goodwin Library fundraisers went well this year. The Friends group raised money through the Hay Day Book sale, Yard/Plant sale and a yearend raffle, all to benefit the Library and thus, our patrons! This allows us to purchase items or provide services our budget does not cover. In 2018 our Friends group funded: several area passes (Farm Museum, Castle in the Clouds, Strawbery Banke, and the Children’s Museum) that offer free or reduced rate entry for our patrons; Poet’s Tea prizes, Heritage Quest genealogy database, our Movie License! Our Friends also provided delicious baked goods for several of our events. The Friends welcome new members! For more information call the library at 755-2944, option 2 or stop in! We are able to provide these and many more programs and services only with the support and participation of the people and the community of Farmington, as well as area businesses, town departments and nonprofits including: Farmington Police and Fire, Farmington School District, Farmington Historical Society, Farmington Woman’s Club, New Hampshire State Library, Rochester Area Librarians, UNH Cooperative Extension Service, Vita Tax Prep, Servicelink, Goodwin Community Health, Community Action Partnership, Lone Oak Ice Cream, FCC Food Pantry, Barnes and Noble, Crowley’s Variety, Studley’s, Butternut Farms, Piscatqua Landscaping, and many, many more! The Goodwin Library is presided over by a Board of Trustees with a constitution and bylaws dating to the 1890’s. Although the Trustees govern, manage, and have custody of the library, it is primarily supported financially by the Town of Farmington. Therefore, the Goodwin Library strives to provide quality services and resources to the community, while cautiously spending and using the funds available in a responsible manner. The library is able to do this because of staff teamwork, volunteer hours (255 hours in 2018! ), support of the Friends group, donations by local businesses and updated processes and procedures; all of which contribute to increased efficiency. The library proves to be a valued institution in the Town of Farmington, so the Goodwin Library appreciates the support for past years and the years to come by the Selectmen, Budget Committee, and the community. In closing, the Goodwin Library would like to extend an invitation to all people who live, work, or own property in Farmington to visit us and sign-up for your free library card. For more information, please stop in or contact us at 603.755.2944 or circulation@goodwinlibrary.org. We are open M/F 10am to 5pm, T/R 2pm to 8pm, and Sat 10am to 2pm. The staff looks forward to welcoming all new and returning patrons into the library family!